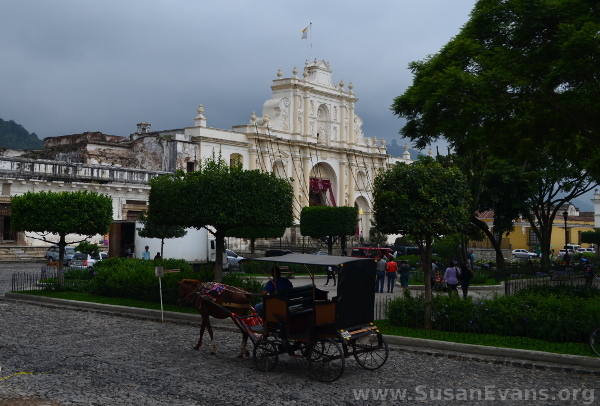 On our way from Guatemala City to Panajachel, we stopped for an hour to go on a walking tour of Antigua, Guatemala. I have always loved this city because of its antique architecture and ruins. When I was a little girl, I used to go on camping trips with Pioneer Girls here. I’ve been to leather factories, candle-making shops, and many other tours when I was a kid. It was fun to take my husband and kids on a quick tour, walking around this majestic city. Each of the antique buildings has a Spanish style, with lots of ornate carvings on the sides of the buildings. Most of the buildings are white, but there is at least one that is a stunning yellow color, which I included at the top of this post. The buildings always have multiple levels with arched windows. Horses and carriages still clop down the cobbled streets, which are filled with colorful dust in different patterns on Easter every year. Parades go down these streets whenever the people are holding a festival. 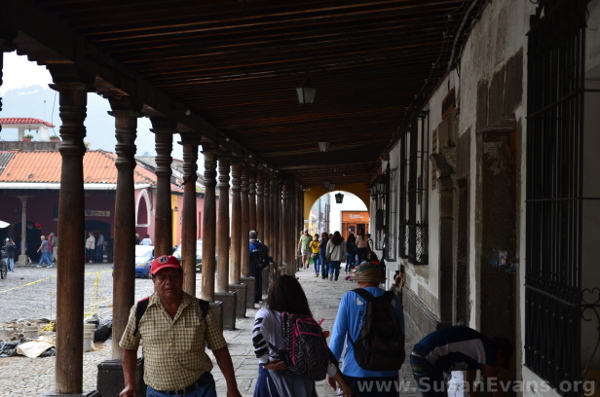 The center square has trimmed trees, grass, and park benches, and the ambiance of the city is laid back and relaxed (although not so much as Panajachel, where we are visiting next). It was so nostalgic to see this city, after not having seen it for over 20 years. I looked at the black bars on each arched window. Security dictates that windows will be broken if there are not iron bars over them. This is true throughout Guatemala. I loved looking down each street. Surprises meet the eye with old lanterns lining a street, or a ruin around a corner. 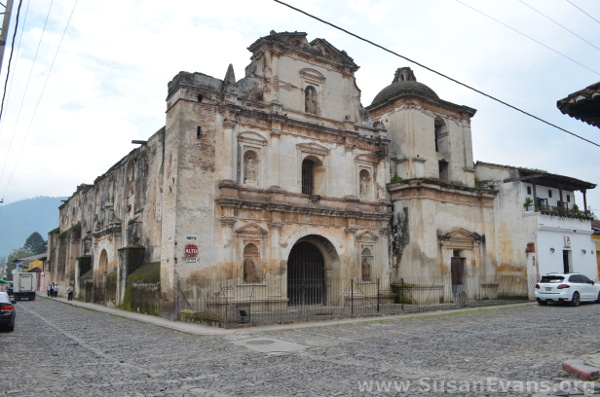 The gates, doors, and entryways are unique, too, and anyone who enjoys architecture would love Antigua, Guatemala! 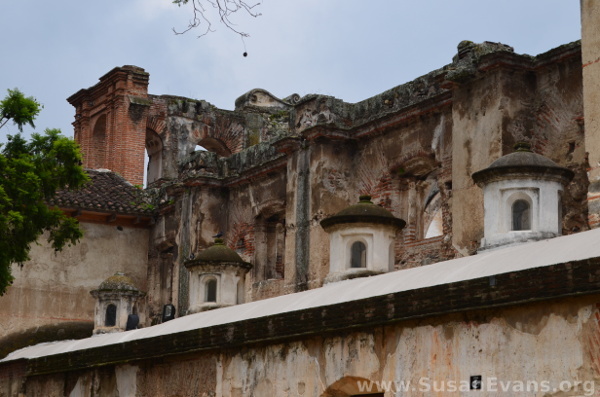 Did you miss our previous Guatemala Adventure posts? If you don’t want to miss any posts in my Guatemala Adventure series, follow my Missionary Kid page. And if you love to read about missionary kids, buy the book! This entry was posted on Monday, August 14th, 2017 at 8:00 am	and is filed under Travel. You can follow any responses to this entry through the RSS 2.0 feed. You can skip to the end and leave a response. Pinging is currently not allowed. How fun! I’ve never been out of the US, so I always love traveling around the world via your blog. 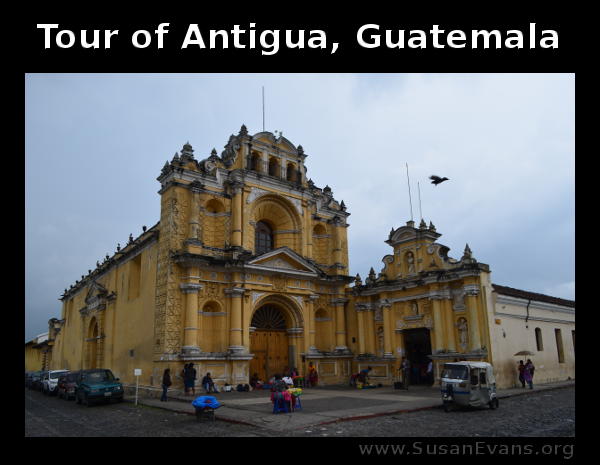 We had such a wonderful visit to Guatemala, visiting places I hadn’t seen for 25 years! How interesting! The archetecture is very cool. What an adventure! The architecture was Spaniard style, which is one of my favorite styles! How blessed you are to have gone all over the world! Yes, I agree that it has been a blessing. I haven’t traveled much after getting married, so this was a special privilege. How amazing! Here’s another addition for me to add to my list of places to see. 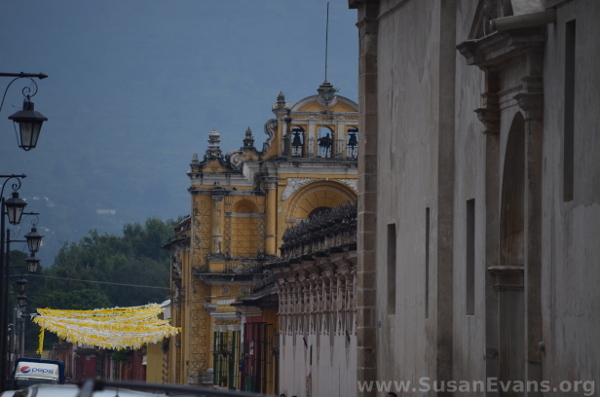 Almost any place in Guatemala is stunning and beautiful. I highly recommend going there! Love seeing Guatemala! The pics are amazing! Thank you; my husband takes great pictures! It’s so beautiful. I can’t help but think of the city I lived in in Venezuela. Many of the buildings architecture is similar. How blessed you are to travel with your family there! Our trip to Guatemala was such a blessing!